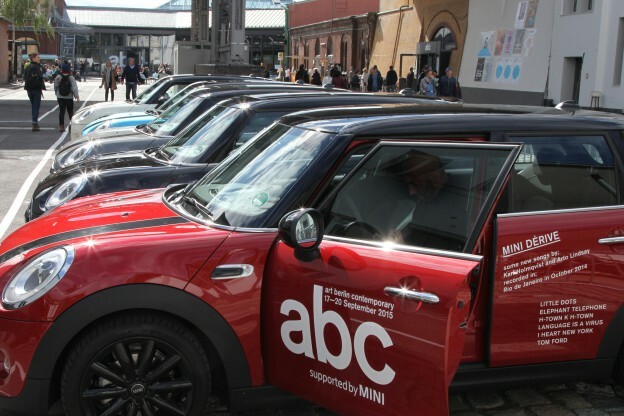 MINI supported the abc art berlin contemporary during the exhibition days and the abc gallery night with a shuttle service and co-hosted the exhibitors’ and artists’ dinner on Saturday evening. As Christian Jankowski did last year, Swedish artist Karl Holmqvist undertook an artistic interference with the MINI vehicles. He presented sound-performance pieces, composed especially for this occasion in collaboration with musician Arto Lindsay. The passenger could choose from different pieces, listed in a booklet in the vehicles that could also be taken along (circulation 1.000). Besides the booklet, Holmqvist also worked together with Studio Manuel Raeder to design the exterior of the shuttle vehicles. The development of this year’s program for our special guests has benefitted from the considerable support of the Senatsverwaltung für Wirtschaft, Technologie und Forschung / Projekt Zukunft. For the first time this year, we welcomed Privatbank Berlin von 1929 AG as a further partner. artek, Pommery, aesop, Zarges and rebeam were our Associated Sponsors. Thanks as well for the support of our media partners artnet, Art Review, Blau, Eikon, Elephant, Flash Art, Frieze d/e, The International New York Times, Kaleidoscope, Monopol, Mousse, Spike, Springerin, Texte zur Kunst, Weltkunst. And of our contributors Berlin Art Link, Bpigs, do you read me? !, Index, NICHE Berlin, Berlin Community Radio, KubaParis and White Rabbit. We are looking forward to cooperate again next year. Save the date for 2016.